KitMonsters – The Hysterical Injury. The music makers’ guide to making music. Sibling duo Tom and Annie Gardiner make up The Hysterical Injury, a glorious onslaught of bass and drums with pin-sharp ethereal vocals overlaid on top. 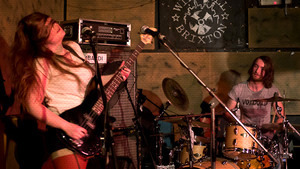 They told us all about their influences, making a massive noise with only two people, and their favourite bits of kit. They’ve been on the road lately, promoting new album Dead Wolf Situation which has had great reviews. Infectious, dazzling and viscerally striking are just some of the words of praise being heaped on the band and the album. We’ve had a lot of positive feedback which is really really nice. It’s been really interesting reading some of the reviews, because as the person that wrote the album it’s interesting to see what people pick up on, all the different aspects of it, some things maybe that I was quite unconscious of. And they all see it as ‘The Album’ but I remember the songs from where I was when I wrote then and what have you, and some of them are from totally different places and times in my life, so it’s interesting to hear what they pick up on. The duo are known for explosive live sets and have tried to capture that feel on the album. Their latest innovative video, Cycle One, was shot entirely on mobile phones and tablets by fans. We asked Annie what she is after with the band’s sound. We’re aiming for an immediate, uncompromising sort of sound with very ethereal vocals, you know, juxtaposition I suppose. Because I like putting extremes together, what it throws up in the middle. It was recorded live, so that is exactly how we sound. I guess we do it by having lots of amps, and what we make up for in not having enough band members or what have you, we have in amps. Although we only have two but it’s all the cabinets that go with it. I was going to say I guess that’s how we do it. Annie: Yeah, and it is. It’s not even two people doing a bit and then layering over another guitar to make up the sound, it’s exactly how you’d see us live. We make it with a lot of pedals as well. Well, not that many. Considering some people… I know one bass player that has 32 pedals. He’s an amazing bass player. I’ve only got about five, six that I use, that I constantly use, and on the album I only used five. The band started out with more of a traditional line-up, but stripping it back to the basics of bass and drums seemed to work best, headed up by Annie. I was in a band in art school and then I left art school and found myself pregnant. I found myself alone a lot of the time so was just making lots and lots of music. And then I wanted to form a band, so a lot of that came out of that era. I was heavily into Joy Division when I was pregnant, which maybe isn’t a great thing. But I really wanted to explore the psycho-ness of Joy Division and then I just love fuzz sounds. I was a massive Sonic Youth fan, always, but then I always had a soft spot for dance music, I’m a big Leftfield fan, and The Knife and bands like that, so I always liked other-worldly vocals. And bass sound. I prefer playing the bass for some reason, it has more resonance, personally to me. I can play guitar, I have played guitar in bands, more resonance with the bass, it leaves more room for the voice live, wavelength wise, there’s room for the voice. And yeah, I had all the songs, went out and found people and it just kind of developed through lots and lots of jamming and just playing a lot, at home and with the band and stuff. 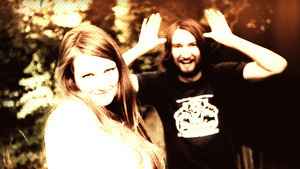 Though Tom played on the original demos, he wasn’t available to join his sister’s band at the time. However, six months ago he did join Annie, forced, as the two of them jokingly claimed, by threats of violence, family rupture and Annie not giving him his sweets back. When Tom joined, that’s when it really just went, yeah. It was great before, the old drummer was fantastic, I did a lot of artistic mileage with him. But what I didn’t get with him was a way of going in and out and dynamically into the songs, and I wanted that uncompromising noise but not all the time, I wanted to be able to pull it back and just sort of be able to have sky’s-the-limit sort of thing and just explore any different type so… Tom joined and that’s what we’ve been able to do since then. The Hysterical Injury are not the first siblings to put together an intense, exciting band, of course. Does it make things easier, working with your brother or sister? Tom: From my point of view I’d say so, yeah, because I’ve played in a lot of bands and …I don’t really have to think about things I just know Annie thinks along the same wavelength. Annie: Yeah, what is great is that we get on as siblings as well. We’re more like brother and sister (laughs) So it is very easy to hang out. And there’s a lot of this kind of crap that goes on in bands that just isn’t there. It’s got to be easy otherwise the stuff gets in the way of the music and I’m so not interested in that. Limited time, life’s work, you’ve just got to get on with it. Tom: Annie feels like a best friend to me, to. We’re quite lucky like that. I’m just lying actually, I don’t like her! They haven’t found it too difficult to make an impact even with a lineup that’s stripped back to bass and drums. Annie: Sometimes if people haven’t seen us before and they just see the set-up, they’re a bit sceptical because the guitar does take up a lot, and keyboards. It’s that hooky place where your ear catches. But I hope that the vocal does that. But some of the effects that I’ve got on my bass sort of catch that in as well because I can hoof up an octave if I want to as well. Annie: Hold your horses Tom! It’s obvious that the pair of them are thoroughly attuned. Their influences are also pretty similar. Annie: I always mention this in interviews, I just can’t get past it but Lightning Bolt are a huge influence on me, they’re just that absolutely otherworldly sound and to see them live is really like visiting another planet. It’s completely compelling. Not that I want to imitate that but I just like being in that space. When I hear it I discover things. Not necessarily about them but about where I want to go. So I really like listening to them for that. The Knife, as well, the Lightning Bolt and The Knife are my favourite influences. The Knife are amazing, vocals, vocal sounds, songwriting and everything, they’re just so good. Tom has a list of influences as well. Tom: Well I love the drummer from Battles, John Stanier, session drummers that some people might not know of, like Dennis Chambers. But Jimmy Chamberlin from Smashing Pumpkins, Chad Smith of the Chili Peppers, really solid timekeepers. They were the sort of reason why I started drumming. I get inspired by any drummer really. This idea that you can pick up on people’s ideas, even if they’re not technically great. 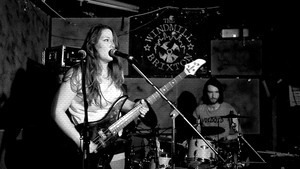 Annie is an amazing bass player and does some pretty unusual things with her gear. She starts with a bass that handles well. I’ve got a Yamaha bass, black. I like it because it feels really nice in my hands, I’ve tried lots of different basses and I find they’re very heavy and very fat but this one’s very skinny. It’s got a nice rosewood fingerboard and it’s got 24 frets so I can get right up high and it’s nice and light so it’s versatile, light, easy to play. Low action so I can tap on it and stuff. Really like it and I think it sounds great. Here she is running us through her sound and her pedals. There’s more on her amp set-up after the video. I use a pedal board, I’ve got six pedals in my Boss pedal board at the moment. I split the signal, there’s a DI box that takes two lines out, one is normal line level, the other’s got lower impedance on it for the guitar amps, so the lower impedance goes to the Fuzz Factory by Z.Vex which is a really sort of wild, noisy fuzz pedal. Then that goes to a Boss digital delay DD-6 which I can do sort of really long delay sections on with lots of sort of scrapes and waaahs from the bass. Technical terms! From the Fuzz Factory which can sort of go on for ever, not loop but just kind of going boom, boom boom if I’m trying to do a bassline underneath that. These go to a set of guitar amps. I currently use a 1969 Ampeg Valve Gemini Twin guitar amp with two, which goes into a cabinet, it’s a combo because I use another cabinet as well and that’s two 12-inch twin coil guitar speaker custom-made cabinet. So the low impedance, it has to be low impedance otherwise the bass signal just blows it up, so I’ve had to have that amp repaired several times because I didn’t know that. Now I do, I’ve learnt the hard way. The bass end of the signal goes through a Sans Amp Bass Driver by Tech 21 that I use for getting real crunch. It can boost all the levels and everything but the top end is really good, really crunches the bass up so some of the more trebly sounds, which you can’t get with bass, which is quite hard to get with bass, it brings it right up into the crunchy guitar end of things, and to have that going through a bass amp is quite Grrrr, quite powerful. That then goes into a Big Muff for the bass. That’s a brilliant bass fuzz pedal, there’s a lot of bass fuzz pedals on the market but a lot of them mush up and muddy a bass sound. That is just a consistent, cross-the-wavelength range, it’s just fat bass fuzz, it’s brilliant, I’m just so pleased with that pedal. That goes into an MXR Carbon Copy delay for nice warm sort of dreamy delay, it’s less harsh than the digital delay of Boss, but I like both, I like the warm… That’s why I have it on the bass amp, the Carbon Copy, it’s just so warm, it’s quite nice to hear bass like that, it’s like you’re out at sea, just being lulled or something, it’s really nice. That goes into a Micropog by Electro-Harmonix, which is their cut down version of their Pog pedal which is quite well-known. That pulls it an octave up or an octave down or both, I just have it on full. Everything up to eleven, that’s how I get that huge spread across the octaves which is probably the organ sound. With the fuzz that just sounds massive so that’s basically it. Annie’s really into her amps but has had a fair few disasters along the way! Well when we recorded the album I had a few accidents with my amps. Oh my life was just a series of amp accidents. We wheeled the Fender Quad into the room and the valve just fell out of it so we couldn’t use that, and then we had an Orange, a big vintage Orange thing and when I put my bass through it it didn’t like it at all and it didn’t work. So we used a Burman Head with an Ashdown 4x10 bass cabinet and my Ampeg Gemini Twin and the Ampeg BR4 1000 watt bass head. With my Lombardi cabinets. That’s two bass 1-inch speakers and two cabs so four times four of them. So it was just like a wall of cabinets and amps and we just had, I think it was about six or seven microphones on there. All old microphones. Neumann Geffells and RE20. I can’t remember all of the mics but that’s how we got that sound. Which is what I play live apart from the Burman. I don’t usually play that thing live but that was a beautiful sounding amp. She’s been able to try lots of amps including iconic British makes. The practice space we used to use in Bath had a collection of valve amps that you could just choose and I always went for the Laney bass stack and a Sound City 4x12 with an old H&H valve 100 watt head and that’s just superb it’s really good. In fact if I stop taking my Ampeg Twin out I’ll get an H&H and a 4x12 to go with it, it’s just beautiful. Really lovely sound, warm, organic, loud. Loud and clear. Annie’s distinctive vocal style has been compared to that of iconic female singers. It’s interesting, Blondie, Kate Bush references. I’m not immediately inspired by those people but I do love them both. When I was a kid I would always find the harmony to a lead line so I would always sing along, I would always harmonise with them so I guess that’s why my recordings gravitate towards having lots of harmonies, so I really wanted to try and achieve that live. Not necessarily having to use other people, I quite like the challenge of keeping everything really efficient and stuff. I had an Alesis In Echo table top kind of processor for a while, which was kind of very very simple and it had this weird transformer on it, but worked in terms of getting a higher harmony. So that got me going and then I used a Digitech something or other which was OK but it wasn’t as good as that Alesis thing. I’ve recently bought a TC-Helicon Voicelive Touch which is just amazing. I really love The Knife and that’s one of the things I love about The Knife, and I found out they used a TC-Helicon thing which I think was the older version of that with pedals, foot pedal switch on it. And that’s great, I can just attach it to my mic stand really easily and it does six-part harmonies, whatever you want really, programme your own harmonies into it. Here’s Annie putting it through its paces. I’ve not long had it so I’m still quite new to it but it’s brilliant, it’s really really exciting, I’m really looking forward to exploring what that can do live, cos it’s OK in the studio, I can just sing the harmony line or what have you, but actually finding an external unit that has its own brains can really push… Again putting the extremes in you can find something interesting inside it so it’s really good. I quite like a reverse reverb but I’ve been using a little big of delay. On the album we had, we used this incredible old plate reverb which was an actual plate. It was a plate in a box that was about three rooms away from the control room that you had to kind of dial in, it had this kind of big cog that you had to turn to the amount of seconds that you wanted reverb on it and stuff, and that gave quite an interesting reverb but the actual tonal quality wasn’t that good so we processed that through something else. The vocals weren’t that processed but we had a… space echo or something on it as well. I’m not exactly sure what was on it but at times there was a bit of delay. I like delay. I like reverse reverb as well. But I don’t use that many effects exactly. The harmony thing is where I go with it. SM58 I think is the nicest vocal mic but that’s only because the engineer on our album preferred that live. I agree with them actually, it is a nicer live mic to sing through. On the album we used Neumann Gefells, Capsule, with a special thing, I can’t remember exactly what it was called but that was a very old mic and it was really nice, really warm tone from it. We tried an AKG, can’t remember, the one a lot of people go for. C12? That didn’t suit my voice at all, it just made it sound like I was all top end. It was really thinning kind of thing. So we went for something that was really old that picked up the mid-tones really well. That was that. But live I try to use a 58, but a lot of the time you can’t really be choosy, you just use an SM57 because that’s what a lot of people use or have available at shows. Tom was inspired to drum from a very early age and big sister Annie played a big part in that. I got into drumming firstly from listening to Annie’s records because I didn’t have any music, I was the younger brother, she had loads of music which was cool. That I could listen to when she was out. The drums were just nice and loud, I liked that. And then I saw the Chili Peppers thing, a video on Top Of The Pops and just thought it looked really cool and though, yeah that’s what I want to do. And obviously the drums were amazing. That’s why I started and from there just started listening to records and copying what the drummer was doing. I always just loved to drum, loved the drumming, I loved the fat sound of it. He was lucky enough to be able to practice on a family kit that belonged to their Dad. It was an old Premier OIympic kit lying around which me and Annie used to muck around on as kids. And I did start playing that when I was about eleven, briefly, and then… and I actually really wanted to start drumming then. I was in school, started the drum lessons, but got thrown off the drum lessons, the music teacher threw me out for missing a couple as I had some football matches or something. So I pleaded to him to let me back on and he was like no, sorry mate, so that put me off. Stupidly. I should have just carried on but I didn’t. So then I started back up when I was 17 with that kit which was lying around. The old 60s kit, it was really nice, Annie’s still got it in the house. 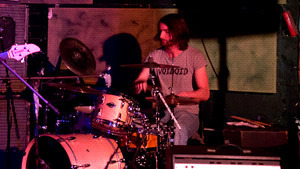 Tom soon made up for lost time by drumming in bands, and has several different set-ups. Here’s what he has to say about his live kit. The kit I use for Hysterical Injury is a Pearl Masters Premium maple kit, and the bass drums are 20” and I’ve got a 10” rack tom, 12 and 14. The reason I use those drums for Hysterical Injury is because it’s maple you get a lot of depth and warm tones for the toms. A lot of the beats are tom-based. The snare drum is a Mapex Black Panther maple shell. 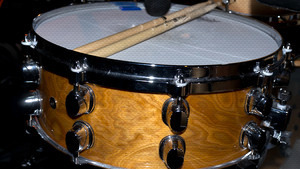 The snare is a nice deep warm resonance, nice crack to it which you need, you need that behind Annie’s fat bass. And obviously Annie’s voice is very warm as well so I think it complements very well with the Hysterical Injury sound. I use Promark sticks, 7A, they’re quite light. I should really use fatter sticks cos it’s louder music but 7A, it’s a small. They’re actually jazz sticks really but I like to feel like I’m not holding sticks, if that makes any kind of sense. I find the fatter sticks like 3A it’s just too much to hold. I just want it to feel nice. 7A is the size that seems to work in Promark sticks. So yeah, that’s sticks! Tom also has electronic kit in his set-up, thought he uses it mostly for recording and rehearsing. Well actually when we were recording the demos for Dead Wolf Situation we recorded it all using the Roland-TD8 which was actually quite an old model of electric drums that actually came out firstly about 10 years ago, which I saved up for a year and a half to buy. I really use them for practice because of neighbours and all that stuff. It works really well for rehearsing, we rehearse with them as well. Annie, she’ll just plug into the interface which has the drums plugged in and just get headphones. A really effective way to practice and it’s very cheap. But it works really well, we did all our demos for the album with it too. Yeah they’re very good and I think we’re looking to go in a direction of more electronics anyway so it might well hit the gigs. For cymbals, Tom uses a mixture of Paiste, Sabian and Zildjian. I like to mix and match, that way I’m getting a good variety sonically. I believe every cymbal is its own instrument. Firstly for my High hats and Ride cymbal, I use Paiste 802 series cymbals. They are good for loud music, very durably; they cut through the mix well with clarity and projection. Whilst holding sweeter tones during quieter sections. Then I use a Sabian AAX studio 16” crash with a 14”AAX Mini Chinese china cymbal. The china has a really quick decay with plenty of harshness, and has enough resonance so you can use it as a crash cymbal. I sometimes add a Zildjian 17’ A custom projection crash to use in heavier sections of songs, its great for filling in space with washy tones. His influences vary but he loves huge rock drum sounds. Well the first two drummers which I was listening to were Chad Smith from the Chili Peppers and Brad Wilk from Rage Against The Machine. The reason I love their drumming is a) they play for the song and b) they were really fat, fat rock drums, so I used to play along to their records when I first started playing. I used to listen and listen and try and emulate what they were doing. And then as my drum journey’s continued I’ve got into a lot of the big session drummers, Dennis Chambers who plays with Carlos Santana, and people like Dave Weckl. They’re all the big session guys. But recently John Stanier from Battles is a big influence, he’s very tight, just energetic, massive energy, just bang on it, he’s brilliant. And the Gallops’ Dave Morait, he’s brilliant too. There’s loads of others. The guy from Placebo, Steve Hewitt, he’s really good. But I tell you, I can hear any drummer, I can be at a local gig, I’m always searching for ideas and checking out what other drummers do. I’m a bit of a geek like that. Tom also teaches and it’s brought him plenty of benefits. I teach privately and I do Bath City College as their head drum tutor on their music course, which is a lot of fun actually. I was quite apprehensive at first but I’ve actually learned a hell of a lot from teaching and my drumming’s improved a lot because I really have to know what I’m talking about. If I’m going to have to explain a certain beat to someone I can’t just pretend I know what I’m doing. So yeah that’s a lot of fun.